I am off on a trip to see a place I have always dreamed of going to. I did not expect to get there so soon. And it's not a minute too fast, as my list of "must sees" has been growing daily. I have never been much of a traveler, but the internet keeps delivering all of these sights to me, and now I want to explore far beyond my keyboard. 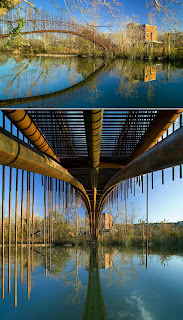 Deputy Dog's 9 Amzingly Unique Bridges You May Not Have Seen is a must see. All 9 were new to me and all 9 were pretty incredible. The Ultimate Movie In My Head keeps expanding.